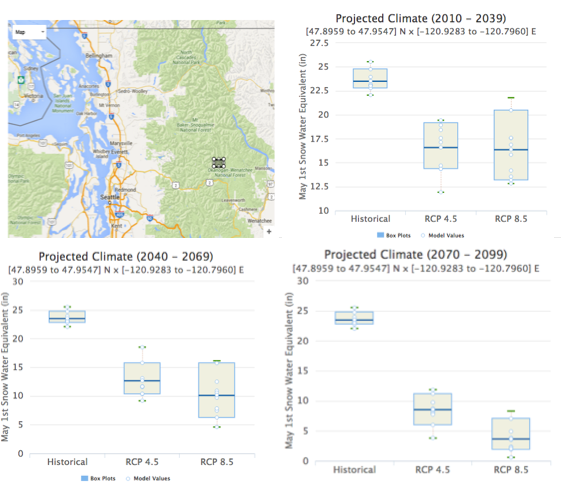 The following is a case study for the use of future climate projections from the Integrated Scenarios project, which illustrates an example of an 'ensemble analysis' where projections from different climate models are used and treated as equally likely future occurrences. People Involved: The Great Northern and North Pacific Landscape Conservation Cooperative are interested in the management of future habitat of several species of plants and animals over the Northwest U.S. landscapes. The wolverine is a species of concern across the contiguous U.S., with its range currently limited to regions with deep snow including high elevations in the Rocky Mountains and Cascade Range. Climate change is likely to affect wolverine habitats in the contiguous U.S.. Female wolverines require birthing dens that are excavated in persistent, stable snow greater than 1 meter deep. The Integrated Scenarios data include information on climate, hydrology and vegetation. Although snow depth is not a variable that is readily archived, we can use snow water equivalent (SWE), which is the liquid water equivalent of the snowpack. We chose snow depth on May 1st as a metric to assess the protection of the wolverine kits although this might be conservative as mid-May is traditionally around the time when kits emerge from dens. "Deep snow" is ill-defined, but we nominally use a snow depth greater than 1m for exploratory purposes. Accounting for the density of late spring snowpack, we use a snow threshold of 15.75" of SWE to identify potential wolverine denning habitat. Data Product: The Integrated Scenarios project provides future hydrologic projections from the Variable Infiltration Capacity (VIC) model and future climate projections from the Multivariate Adaptive Constructed Analogs (MACA) statistical downscaling of ten CMIP5 model outputs over two future scenarios (RCP 4.5 and RCP 8.5). Variables: We use the snow water equivalent (SWE) metric on May 1st from VIC outputs as a proxy for persistent snow during the "denning" season. Time Period: We look at the early/mid/late 21st century with the future years of 2010-2039, 2040-2069, 2070-2099 and compare to criteria for wolverine habitat in the historical years 1950-2005. Global Climate Models and Scenarios: In this study, we use all of the 20 model results available from the MACAv2-LIVNEH in the Integrated Scenarios project in an 'ensemble study', In an ensemble study, each model projection is considered to be an equally likely possible outcome. The 'signal' from the climate study is considered to be the multi-model mean of all individual model projected changes. A measure of the 'uncertainty' in the study can be gleaned from either the standard deviation of the projected changes or the range in the projected changes. 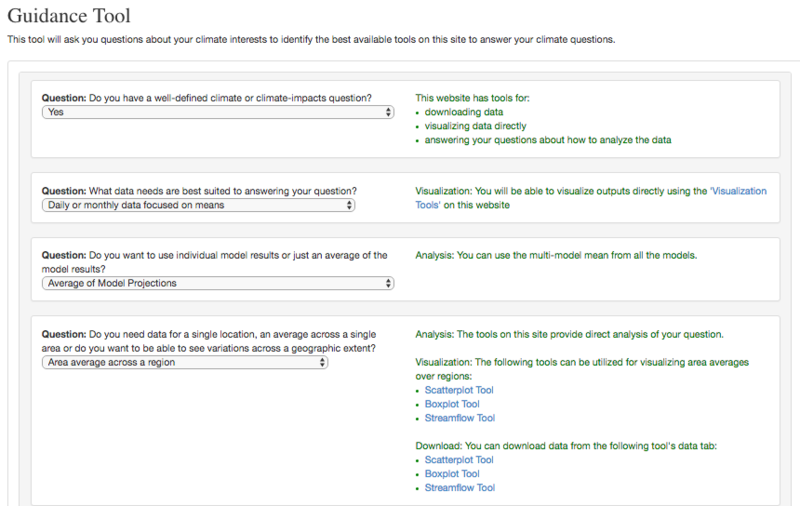 Guidance Tool: Utilizing the guidance tool from the Integrated Scenarios website, we answered a series of questions about our climate interests for the Wolverine. The results pointed us to tools for downloading data and visualization tools on the site. Results from the Question and Answer session of the Guidance Tool to the Integrated Scenarios website. Mapping Interface Tool: Utilizing the map summary tool from the Integrated Scenarios website, we chose May 1st snow water equivalent from the Multi-Model mean of projections from VIC (with the maximum of the colorbar to be 15.75" with transparency for out-of-range. The map layers shown here can then be downloaded in either netcdf or geoTiff format for your own exploration. Geographical areas where May 1st snow cover is greater than 15.75" for (Left) Historical (1950-2005) time period and (Right ) Future RCP 8.5 (2040-2069) show potential areas of wolverine habitat from looking at only snow cover. Boxplot of Projections Tool: Utilizing the boxplot tool from the Integrated Scenarios website (with 2040-2069 as the future time period), we can see the spread of projected changes in May 1st snow cover across the 10 GCMs for the two different future scenarios for a region of wolverine habitat in the North Cascades of Washington . From this tool, we can see that historically the May 1st snow cover is great than 15.75", but in the mid/late 21st century the projection is that May 1st snow cover will be less than 15.75". (Upper Left) A location in the Cascades where historically there is suitable May 1st snow cover (~23") for wolverine habitat, (Other Figures)Projected changes in May 1st snow cover from 10 downscaled GCMs for May 1st average snow cover for this region where (Lower Figures) by mid and late 21st century this region will not be suitable habitat( May 1st SWE &lt;15.75") for the wolverine. Data Portal Tool: Utilizing the data portal tool from the Integrated Scenarios website, researchers can use the tool to download the daily data for SWE to investigate the percent of days that regions are covered with snow. Image of wolverine by Steve Kroschel, USFWS, public domain.